All homes need humidity control. And in southern climates, they need it year round. Aprilaire has a solution for every size home. From our compact 65-pint unit – perfect for townhomes, condominiums and homes with a closet HVAC system – all the way up to our 135-pint unit for homes that are 4,000 square feet or more. 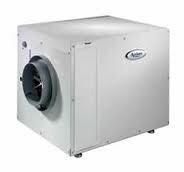 Aprilaire can provide every homeowner the whole-home protection and performance of central dehumidification. Air conditioning alone can’t satisfy your home’s humidity requirements. Your air conditioning system is designed to control temperature, not humidity, and only removes humidity as a byproduct of cooling. During the spring and fall seasons when it’s still cool outside but damp inside, your air conditioning isn’t running and your house is uncomfortable — you need an Aprilaire Whole-Home Dehumidifier. Installed as part of your home’s heating and cooling system, Aprilaire central dehumidifiers pull air from every room in your home through the return ducts. It removes the moisture and then sends dry air back throughout your home. It works in conjunction with your air conditioner to efficiently balance the humidity levels in your home, but can also work independently on days when you don’t need the air conditioner. An Aprilaire Whole-House Dehumidifier works equally well in new or existing homes, and is truly the complete solution for your home’s excess indoor humidity problems. Whether you’re updating your home to be more healthy, energy-efficient and sustainable or you’re building a new green-certified home, Aprilaire offers a complete line of innovative products designed to improve the quality of indoor air. Our dehumidifiers help by removing excess moisture and reducing the damage that mildew and mold can have on the sustainability of your home and the health of your family. Central Dehumidifiers help qualify your home for the Green-Built Certification Program of the National Association of Home Builders. The temperature is at the thermostat set point or below, but you still feel uncomfortable. You get a clammy feeling or suffer from sleepless or restless nights. You use blankets to keep warm in the middle of the summer. Molds thrive in high humidity conditions. Wood floorings, cabinets and furniture also suffer from warpage and structural damage. Remove the worry and protect your home with an Aprilaire dehumidifier that guards against excess moisture. Never again touch a surface in your home that is wet with condensation – a breeding ground for mold. By using a dedicated central dehumidifier along with air conditioning, you can save energy. The dehumidifier removes moisture from the air while the air conditioner removes the heat. Simply increase your thermostat by 3 degrees, set your dehumidifier to 59% RH, and be more comfortable! Never again over-cool your home to remove moisture from the air. There are two different models of Aprilaire Whole-Home Dehumidifiers that can solve your home’s excess humidity problems. Aprilaire Models 1730A/1750A/1770A Whole-House Dehumidifiers The only truly effective solutions for total home excess moisture control. The Aprilaire Whole-House Dehumidifier makes a lot of sense—want to know more? Call us!